This is primarily because of the various opportunities and ease in hiring that the food industry presents younger workers. But just as there is an abundance of work opportunities in the restaurant industry for youngsters, the commercial kitchen is also rife with restaurant health and safety hazards. With youthful inexperience, these risks are just accidents and injuries waiting to happen. How exactly do you make sure that your workers, especially the younger ones, are protected against the common injuries in the commercial kitchen, and promote overall restaurant health and safety? Adequate protection against workplace hazards begins with identifying where and what these dangers are. The OSHA has identified some of the most common and notorious risks in the commercial kitchen setup. Here are just a few of them! In the ideal world, restaurants are peaceful places. But this is not always the case. Restaurant workers are vulnerable to workplace violence, both from conflicts between co-workers and aggression from customers like this much-publicized brawl between a fast food worker and customer. How to protect your employees: Aside from making sure your restaurant has adequate security personnel, it is important to train all your employees – especially those within management capacity – on how to handle conflicts. Your workers must be able to identify the common causes of violence in restaurants and act accordingly, prioritizing the welfare and safety of your restaurant crew and other customers. Electrical hazards in the restaurant kitchen can range from poor cleaning practices and improper use of electric cooking equipment to faulty wiring and electrical outlets. Though not quite as common as fire or cut hazards, restaurant workers are still exposed to chemical injury through the improper use of cleaning agents. How to protect your employees: Make sure that any chemical is stored properly and according to manufacturer’s standards and away from your food preparation areas. It is also important to equip your workers with the right protective gear for whenever they have to handle chemical substances. Prolonged standing is the norm in practically every restaurant position – from the cashiers and the hosts to the people manning the counters to the back of the house. And this practice has been associated to a whole list of health risks including chronic pain in the lower back and extremities, varicose veins, and stiffness of the neck and shoulder muscles to name a few. How to protect your employees: Create a schedule that allows your employees to take sufficient breaks to be able to rest their legs. And because prolonged standing is likely inevitable in many positions in your operations, make sure to equip your floors with ergonomically-friendly anti-fatigue mats to alleviate pressure and exhaustion to the back and lower extremities. It goes without saying that a busy kitchen, with multiple burners and ovens working all at once and a mass of fast-moving people working round-the-clock, is vulnerable to fire hazards. Fires in food establishments account for 6% of all non-residential building fires every year. And while these fires are not necessarily large and cause fatalities, the smallest fire damage is costly and bad for your business. How to protect your employees: There are so many sources of fire hazards in a restaurant, which is why it is important to understand the basics of fire safety in a restaurant. This includes staff training not only for new and incoming employees, but a regular brush-up of fire safety skills for every employee across the different departments of your workplace. It is also important to have professionals assess your building’s vulnerability to fires, identify the risks, and create plans to address these fire hazards in your business. The restaurant kitchen’s large selection of knives and massive equipment in food preparation poses dangers of getting cuts, accidental amputations, and/or getting crushed by large machines. How to protect your employees: Make sure that large and/or dangerous machinery is attended to only by properly-trained professionals and that they are in the right physical and mental condition when handling large equipment. To ensure protection against sharp and heavy objects in restaurants, especially by young workers, make sure that everyone receives proper training. 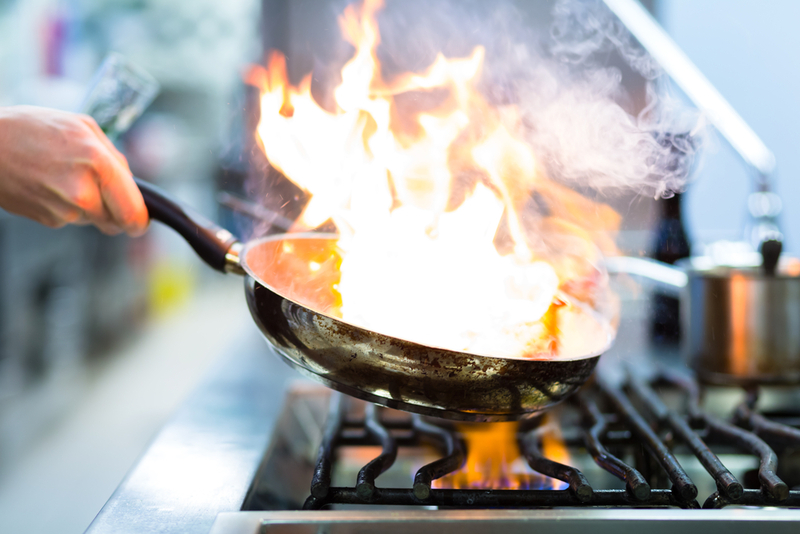 From boiling water to scalding hot oil to sizzling plates and hot pans, burns and scalds are some of the biggest and most common dangers that restaurant employees – even the seasoned ones – experience on a regular basis. How to protect your employees: Aside from a floor layout that allows for adequate room for moving around in the kitchen, it is just as important to provide your employees with necessary tools to help in handling hot objects and surfaces. This includes heat-resistant gloves, kitchen towels, and silicon pot holders, among other things. Spills and greasy floors are synonymous with running a restaurant – and without prompt and proper cleaning, dangerous slips, trips, and falls are inevitable. Aside from moisture and grease, improperly installed carpets and mats as well as poor floor planning and storage are also notorious for causing slips and falls. How to protect your employees: Make sure that the personnel in your restaurant attend to spills and grease on the floor quickly and properly using the right cleaning tools like wet mops and dust mops. On top of that, make sure to invest in a floor mat rental program that not only delivers reliable anti-slip floor mats but also regularly replaces your floor mats before wear and tear and heavy foot traffic render them unsafe. – Training and Supervision. Provide adequate training and supervision to your young workers – from proper handling of breakables, equipment, and tools, to proper responses in cases of emergency. – Observance of Industry Standards on Safety Across All Departments. Enforce strict compliance of safety standards across every level of your operations. – First-Aid Skills. Should emergencies arise, e.g. grease fires, electrical shocks, cuts, sprains, falls, etc., it is important that every employee has at least a basic knowledge of first aid and emergency response. – Uniforms. The right apparel in the kitchen is designed to provide some level of protection to the wearer while immersed in the risks in the workplace. Make sure to get high-quality uniforms that are as durable as they are comfortable to wear. – Mats. Floor mats are easily any workplace’s first defense against slip, trip, and fall accidents. Make sure to get ones that are of the perfect size and feature adequate rubber backing for optimum protection. Make Restaurant Health and Safety a Habit! Don’t let the restaurant health and safety hazards that come with the job hinder your business growth. Education and prudence are your best protection for your workers. For more information about working with young employees in restaurants, you may refer to OSHA guidelines here, here, and here.